We offer decking, fencing, patios/paving, landscaping, low maintenance gardens, fencing repairs and general maintenance. We do not have a hard sell approach. Quotations will be provided by friendly staff and the decision is left with the customer to consider. We are a local Derbyshire business and offer a high quality service. Very friendly and polite. Excellent communication and punctual. Trader did an excellent job and cleaned up after he had finished. Reused some fence panels which we thought were beyond repair which saved us money. It was a pleasure having Fred build our new raised decking. It looks straight out of a magazine, it's beautiful! Despite the access to the raised garden via a narrow stair way, from the start to the end of the job, Fred has been very professional, polite and approachable. He offered the best advice and was very helpful, organised and kept the place tidy. He also repaired a damaged fence and added some extra features which now makes it looks brand new. On completion he cleaned the whole site leaving it very neat and tidy. I will definitely be calling Fred back again for some more work. I highly recommend Abbey Decking Systems. Fred has done a few jobs for us, and I've always been very happy with this work. He gets back to you quickly, gets the job done promptly and charges a fair price. I'd recommend him without hesitation. Very professional, with attention to detail. Excellent job. Would highly recommend. All aspects of the work thoroughly explained. Prompt and clear quote. Very high standard of work and professionalism. Would highly recommend Abbey Fencing. Really delighted with the work Fred has done on our property, would recommend him to anyone, really hard worker, really does put his all into making you satisfied and to do the best job possible, really pleased. Beyond delighted with the speed and service provided by Fred Abbey Decking and Fencing Services. Would certainly recommend him and call him again for any other work I might require. It is a busy time of the year I contacted a number of fencers to do a small job of replacing 3 posts. Fred responded gave me a quote over the phone. He kept me informed of the day he was doing the job eventually coming on a Sunday morning. He did a professional job which I was really happy with. He will be my first port of call for any further jobs. Most helpful and a consistent. Abbey Decking supplied an exceptionally high quality product with a great level of service. I would use this company again. Fred carried out a makeover of my rear garden which I wanted to be no maintenance and include a new fence. Sturdy bespoke fence erected, sleepers installed allowing garden to be levelled and gravel and slate laid. This was carried out by Fred over a period of four days in occasionally inclement weather. The finished project is of excellent quality and I would not hesitate in recommending this company. Excellent work. I could not fault the workmanship, I will definitely use again and recommend to others. He has done an very excellent job working in very cold conditions. I have absolutely no hesitation in recommending this company. Very good communications. Written quotation - clear and un-ambiguous. Pleasant and co-operative. Prompt replies by email/telephone on any queries. Gave good advice on security locks for gates concerned. Would use again, everything done in a timely and efficient manner. Highly recommended, great work and really pleased with the end product. Excellent job combining concrete posts and trellis panels, with careful attention to detail and tidyness. Very pleased with result. Would certainly use this trader again. We are very pleased with our fence and gate. Fred is an excellent craftsman and our fence is better than we could have expected; sturdy and well-made yet very attractive. We would recommend him very highly. Very pleased with the quality fence panels supplied and erected by Abbey Decking. Would recommend this company to anyone. Fred and his son did a good job replacing our old fence panels and putting up a new garden gate. They were polite and listened carefully to our requirements. Their price was fair and they came on the day arranged. I would recommend this company. Fred at Abbey Decking and Fencing did an excellent job of replacing an old fence down the side of our garden. He removed the old fence, put in additional posts to ensure it's sturdiness and then put up the new one, all in one day. The new fence looks excellent. He was clean, tidy and didn't mess up the garden whilst working. Extremely satisfied with the work done. Excellent team, very hard working, reliable, obliging and honest. 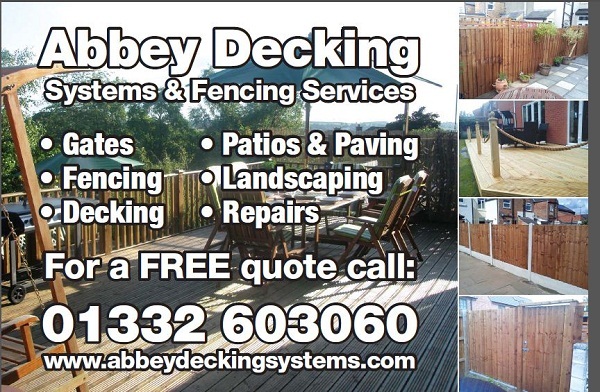 No hesitation in recommending Abbey Decking and Fencing to anyone. 10/10. The job had been offered to another firm. Abbey doing similar on the neighbour's fence, and they made a suggestion to solve a technical problem to everyone's satisfaction. Quality of the work was good, and the site was left tidy at the end. My mother is quite frail and has had numerous falls. We were keen to ensure she could enjoy sitting in the summer house and access safely via a raised decking walkway with hand rails. Abbey Decking systems did a great job building a high quality walkway to their own design with hand rails and non - slip decking. The quality of the work is a very high standard all carried out with the minimum of disruption. This scheme has given us peace of mind that my mother is as safe as possible walking between the house and the summer house, a great job! Would highly recommend this company for quality of workmanship and production of a bespoke design and build. Top quality panels made and fitted by supplier, efficient fitting and old panels taken away. Fred and his colleague worked hard all day long and completed the job in 1 day. Fred is a very friendly man and kept us informed throughout the day on how the job was progressing. I would recommend Fred 100%. Craftsmanship! An excellent job - went the 'extra mile'. Well worth the money. Once again very pleased with the standard of workmanship of Abbey Decking and Fencing. My family have used Fred several times and he always listens carefully and does exactly what is required. He is very reliable and always does the job when he says he will. He is very skilled and built our fence very quickly and skilfully. It is exactly what we wanted. He charges a fair price and leaves the site very tidy. I wouldn't hesitate to recommend him. First class service turned up when he said he would. Very satisfied with all work done. We were kept informed at all times, left everything clean and tidy. Would not hesitate to have back again. This work carried out reached way over our expectations. The quality of this hand made fencing and hand made gates are amazing. Very strong very secure and look the part. Work completed quicker than expected, even left the premises in clean and tidy condition as found. Many thanks to Fred for all his hard work. We highly recommend his services 110% We will be using him again for other projects. Fence erected quickly and efficiently returning next day to complete the job and amend any alterations we required. Fred was professional, attentive and detailed from start to finish. He took time at the quotation stage to make sure that options were considered. Communication about the start date was good. Once the work started he kept me fully informed and consulted regularly to make sure I was happy. It was quite a difficult site with different levels to cope with but the result is excellent. I never felt that Fred was rushing the job, he wanted to get it right. Overall I am very pleased that I asked Fred to do the job and would have no hesitation in asking him to carry out further work or recommend him to others. The work was a bit expensive but the quality is undoubtable. The fence is solid, the decking he put up looks great. He even came back and replaced a panel that had warped & fitted a bolt to stop the gates rattling in the wind. I was very pleased with the work done. Everything was discussed with me and agreed. Both men worked very hard and quickly, were pleasant and polite. Arrived on time, finished ahead of time, hard working, available, would recommend to anyone. Very professional & helpful at all times. Everything was made clear and no hidden prices. Abbey Decking have completed an amazing job which has made a massive difference to our home. Very good work completed on time, site cleared, all rubbish taken away and was very amiable and pleasant. Would recommend him. Fred did a great job. He worked very hard and cleaned up afterwards. The end product is very sturdy and should last a very long time. Tradesmen like Fred are hard to come by. Reliable, honest, hardworking and very attentive to every detail. Without Trusted Trader and the excellent reviews Fred has achieved on it, I would have never found such a good tradesman. Thanks very much to both. Did a very good job - supplied panels and made secure. Also made a special plate to corner panel. Did everything in a reasonable time and was very pleasant. I would definitely recommend. Fred bought high quality decking to match what we already had, fitted it expertly and was friendly throughout the job. I would recommend him wholeheartedly. Work was carried out as requested, very competently.